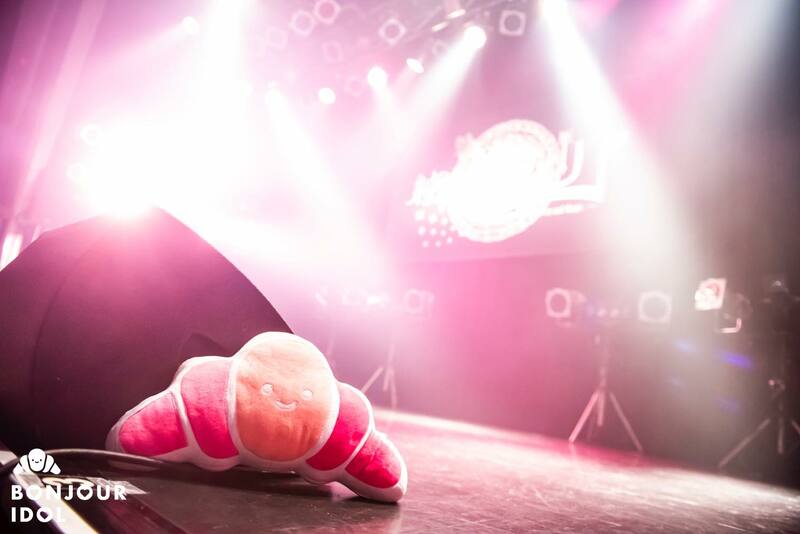 It is a big step for Junjou no Afilia this year: the group celebrated its 10th anniversary in 2018, and therefore flew on a national tour for this special occasion. Debuting in 2008 under the name Afilia Saga East, the group, made of members of the maid cafe franchise of the same name, has its fait number of successes and prestigious collaborations. Produced by Shikura Chiyomaru and Momoi Halko, their discography also features some titles produced by the legendary Tsunku. As we are quite used to observe their little sisters Iketeru Hearts, it was only a matter of time until Bonjour Idol finally meddled into Junjou no Afilia’s business! We had the opportunity to spend the day with the group for their tour performances at TSUTAYA O-WEST in Shibuya on March 16. The group offered two performances that, despite being built on a similar pattern, were made of completely different songs. As we are getting closer to leader Maho’s graduation, active member of the group since 2010, it was the perfect occasion to bring back some vintage and rarely performed tracks – much to the pleasure of their long-time fans. The select corner (unit song segment) of each show divided Junjou no Afilia in three units. Kaori, Anna and Amina notably delished the audience on the very catchy and playful “Spell☆Of☆Love” during the afternoon performance. Yumi, Chloe, Serrah and Kana juggled between styles, with the hypnotizing charm of “SPRInG FAcTiON” and the orchestral notes of “Kono Uta ni Eien Ai wo Sasage ku”. Finally, Beel, Maho and Meimi showed off their air-volleyball skills on “Hatsukoi///Stripe” during the night show. The lucky fans who came for the afternoon show were rewarded by a small game organized by Chloe! Two teams, fans versus idols, were fighting each other in a delirious blind test, mixing older and newer Junjou no Afilia titles, but also songs from sister group Iketeru Hearts or Purely Monster, another idol group produced and managed by the same team. It will be difficult to forget the little challenge given to the losing team of fans, that the very cheerful Anna happily took over, impersonating her group mates under roars of laughter and a round of applause. You say tour, I say new costumes and new song! 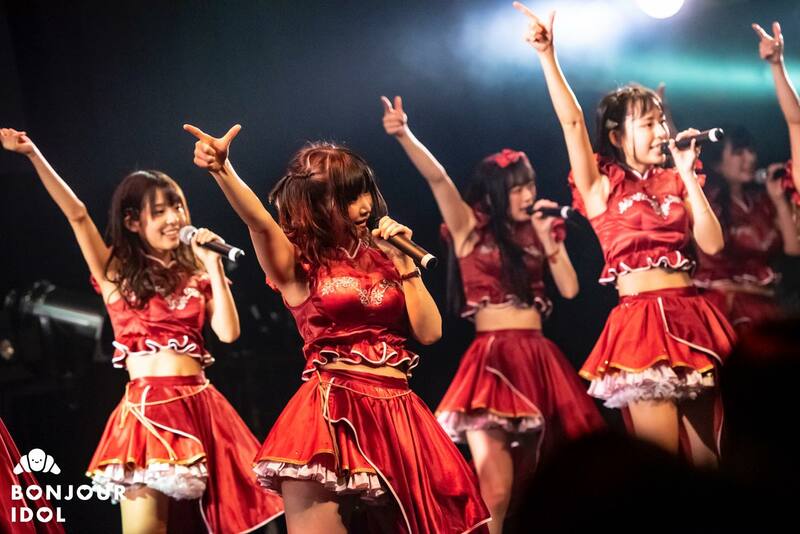 Junjou no Afilia had a few minutes during the unit songs to change into their new outfits, spring-like sky blue satin short dresses with crimson accents, moving on stage in their shiny ruby slippers that the Wizard of Oz only wishes he had. The tour song, “Kiseki to Mahou no Chronicle”, is a emotional anthem, dedicated to the legacy of Afilia, but also to the close-knit bonds that tie all the members who took part of the group’s history throughout these past ten years. Junjou no Afilia will be back in town for the final performance of their tour, on April 27 at Ebisu Liquidroom. A show that the Bonjour Idol team will definitely not miss, climax of an exceptional tour for one of the most respected groups in the indie idol industry. Our video cameras will also be part of the trip, so be ready!